My fifth stadium of 2012 was on Thursday 23rd February 2012 at Tithe Farm in Rayners Lane, London. 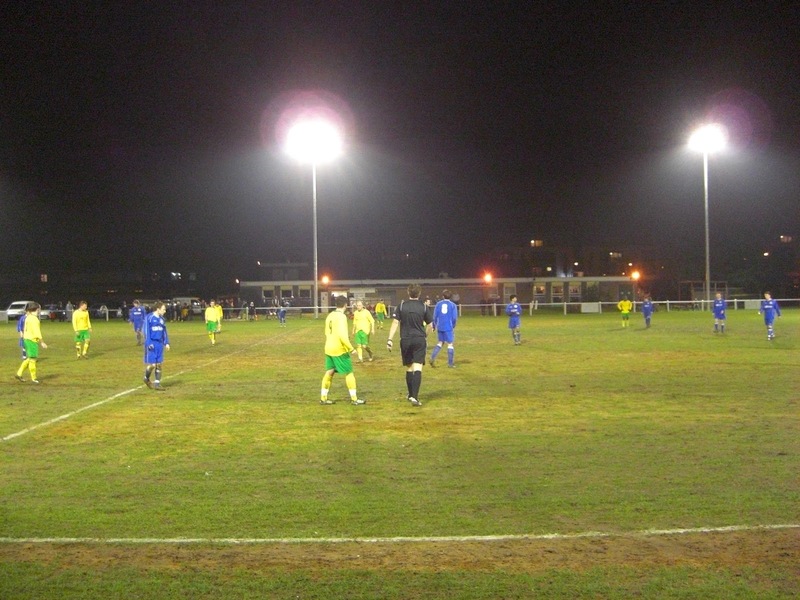 The match was Rayners Lane vs. Hungerford Town Reserves in Hellenic League Division One East. Tithe Farm sits in Rayners Lane, a suburban area of north-west London. The ground is just over half a mile from Rayners Lane tube station on the Metropolitan Line and has been the home of Rayners Lane FC since they were formed in 1933. 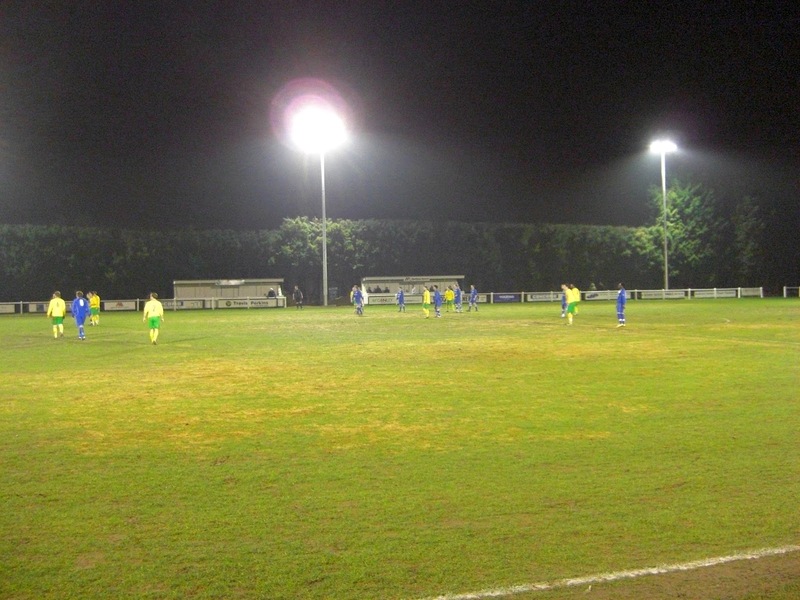 The ground is part of the Tithe Farm Social Club complex with the social club in the middle of a concrete pitch to the north and the grass pitch to the south. In addition to the social club, the north side of the pitch has several picnic benches where fans can sit to watch the game, and the team dugouts. The rest of this side of the pitch is general uncovered standing. On the south side of the ground there are two small brick stands either side of the half-way line. These consist of two rows of benching with plastic seat covers with around 75 seats between them. The space behind the two goals is fairly restricted with tall trees separating the venue from housing at the western end and the road at the eastern end. As a result there is a thin concrete walkway which is perfectly sufficient for the level the club is playing at. The game began with the visitors having the best start and took the lead in the 7th minute in comical circumstances. A misjudged backpass to the home goalkeeper saw him pass it straight back to his defender who then attempted to clear but only succeeded in cannoning the ball off a Hungerford striker with the ball bouncing into the net. The away side had chances to double their lead in the following minutes but instead found themselves pegged back to 1-1 in the 24th minute when the home side converted from the penalty spot after a trip in the box. Rayners Lane begun the second half brightly and took the lead in the 58th minute when a long ball caught out the Hungerford defence and the Rayners attacker rounded the goalkeeper and slotted home. However, just nine minutes later the game was all square again as a close range shot was palmed away by the Rayners Lane goalie only for Hungerford to hit the rebound into the roof of the net. The game was then decided by a three minute spell in which the home side scored twice. In the 79th minute a poor goalkick let in the Rayners Lane striker who lobbed the advancing keeper and then in the 82nd minute Rayners Lane wrapped up their win after one of their players surged into the area, beat two defenders and struck low into the bottom corner.